This riff on the traditional and popular Vietnamese sandwich is an explosion of phenomenal flavors carried by the quality and taste of our Hoffy XXL franks. Combine the vinegar and carrots and stir to combine. Let the carrots sit at room temperature for 10 minutes to marinate. Preheat your backyard BBQ or a grill pan to medium high heat. Add the hot dogs to the grill and cook until golden brown all over, about 4 minutes total. 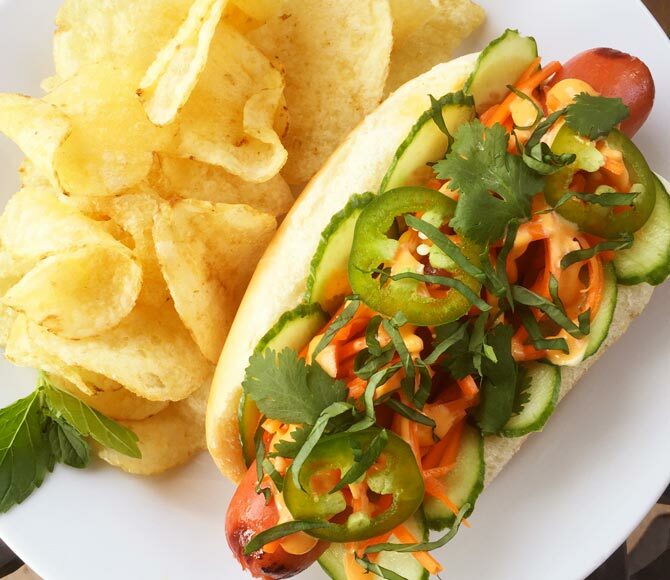 To assemble the hot dogs, place a hot dog into each hot dog bun, top with a 1/4 cup of the pickled carrots, a few slices of cucumber, a few slices of jalapeño, cilantro leaves, mint, and some chopped peanuts. Finish with a drizzle of the Sriracha mayo.